After walking through the area with textiles a the Gwangjang Market, we entered the part where fresh fruit, vegetables and produce were sold. It was a Friday afternoon, so it was not very busy at the market – most vendors were just sitting there and peeling beans or chatting to the vendor next door. Some invited us to come over and have a look at their produce. This was actually one of the few times that I saw fresh fruit and vegetables being sold in Korea. 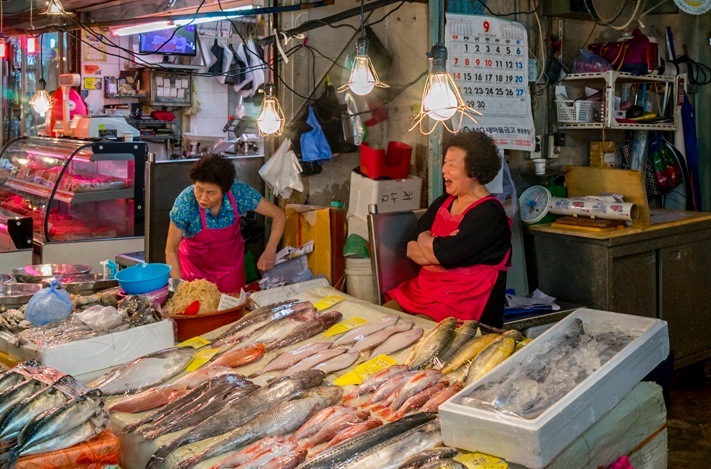 That’s one thing that surprised me, how hard it is to get fresh produce and how expensive it is – especially compared to Hong Kong, where most items are also imported, but they are easily available! 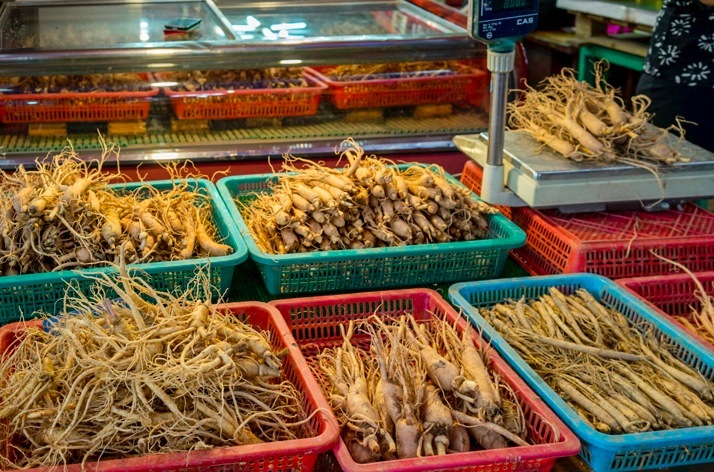 Some stalls specialised only in one product – like Ginseng for example. 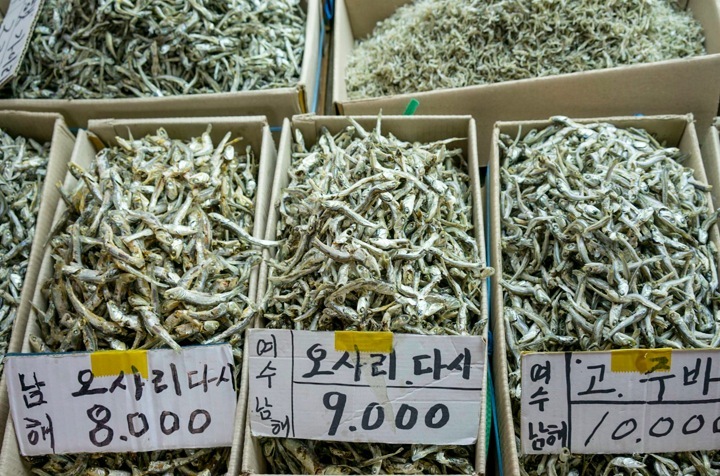 The root is used in many herbal teas, hair tonics and cosmetic preparations – lots of items that are advertised with Korean Ginseng in Hong Kong are quite expensive! 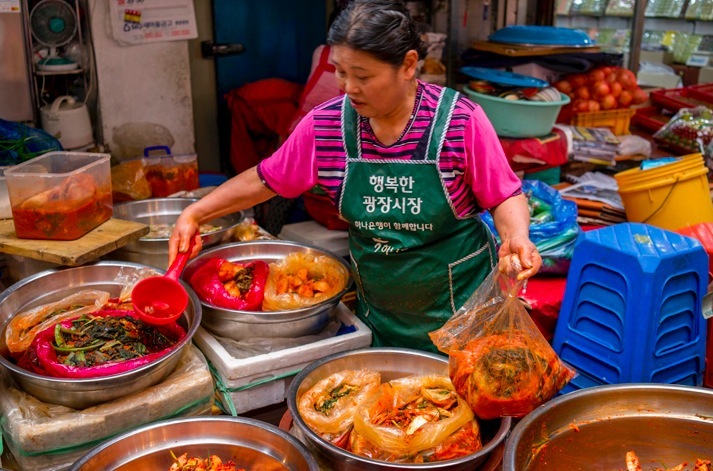 But of course, the most popular item being sold at the market is Kimchi. A traditional fermented Korean dish made of vegetables with a variety of seasonings. It is often described as spicy and sour. There are hundreds of varieties of kimchi made from napa cabbage, radish, scallion, or cucumber as a main ingredient (here’s one of my previous blog posts on Kimchi with more details about the making). 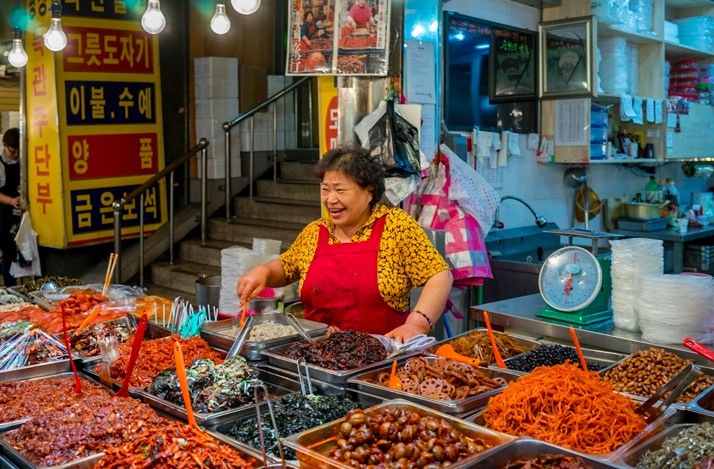 I love Kimchi and I ate so much during my stay in South Korea – and even if I’ve tried several flavours, I didn’t manage to taste anything close to the number of different varieties those ladies were selling! 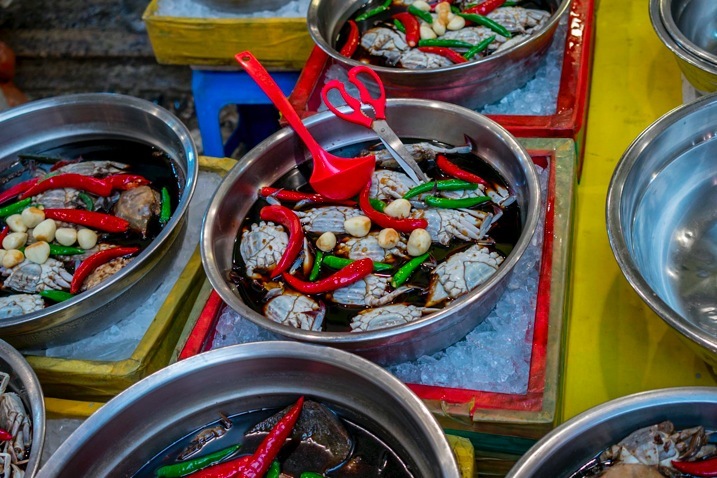 At the market I also noticed lots of pickles crabs and seafood – my assumption is that they will taste also spicy and sour, given the number of chilis and garlic that have been added! Finally, after walking through an area with lots of fresh fish on sale (beautifully arranged, totally fresh and without any smell!) we discovered a section with dried fish in all sizes! 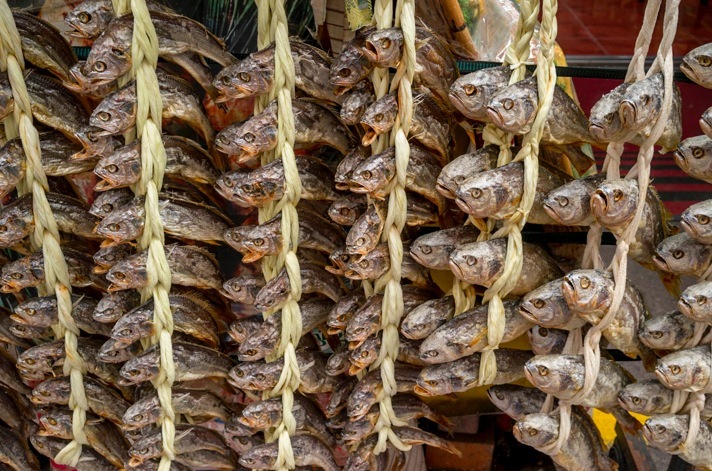 I noticed that dried fish is used as an ingredient or topping on a number of different dishes – from rice dishes to soup dishes – but I actually don’t have any idea how to use it. All I know is that it looks pretty! 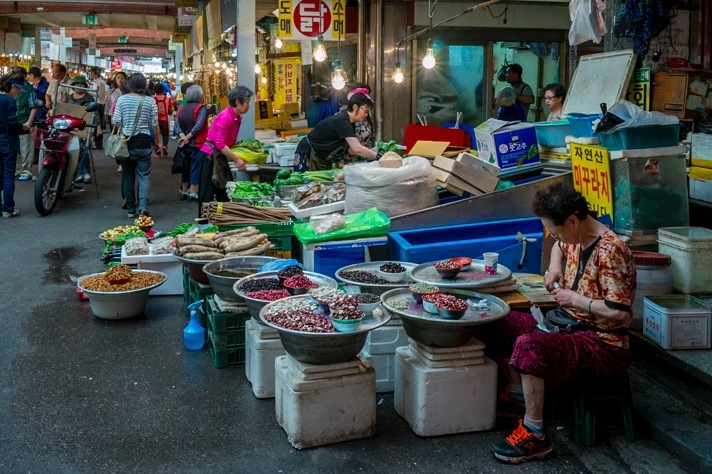 There are some fantastic fresh produce markets in Jeju, and it seems all locally grown. 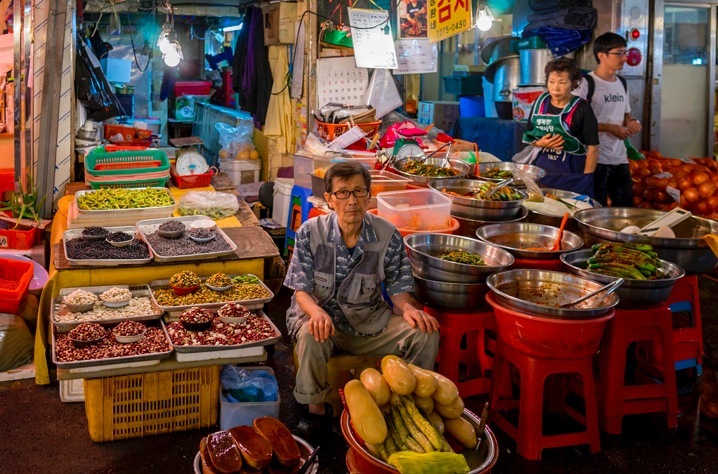 It is surprising if Seoul doesn’t have lots of fresh fruit and veg on sale. They probably have – if you know where to look. All the 7-11 and convenience stores don’t seem to sell a single apple or banana! 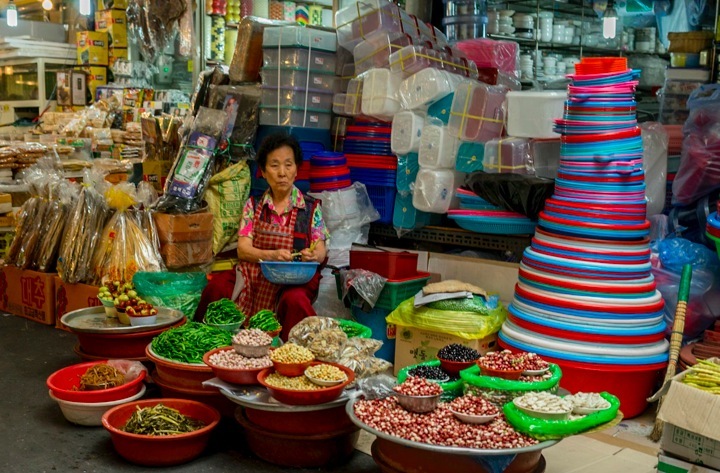 The markets in Korea are amazing and SOOOOO ridiculously cheap! Am thinking markets in Asia in general will be the number 1 most missed thing about Asia for me when we return home!! !